The writer said she had been planning a funeral and searched on Google for funeral homes. She typed "f-u-n-e-r-a" and Google suggested funeral homes near her as well as other funeral-related websites. Just then, a friend called her on her landline phone. The friend suggested that the woman make food called “funeral potatoes” for a gathering after the service. She called a relative and told him what happened. He thought it was a coincidence. So he experimented. He typed "f-u-n-e-r-a" into Google. The search suggestions that appeared were funeral, funeral songs, funeral homes near me, and funeral homes. Then, the man said the words "funeral potatoes" out loud. Then, he re-typed "f-u-n-e-r-a" into Google. Funeral potatoes, funeral and funeral songs appeared. The woman who wrote about the experience says she and the man had their cell phones in the room with them at the time. It seemed the cell phones had listened to what they were talking about. Cell phones may indeed be listening to us, even when we are not using them. Stories on the Internet tell of people who got Internet search results or advertisements based on words they said aloud near their cell phones. When we give an app permission to use our cell phone microphone it is not clear when it is listening to us. There are no signal lights or icons that show when the microphone is turned on. Facebook also told the BBC it does not permit companies to target advertising based around microphone data. And it said it never shares data without permission. Voice of America Learning English also experimented with an iPhone and an Android. We did not find that search results or ads change based on spoken information. The BBC asked developers if they could create an app that could activate a phone's microphone secretly and record speech taking place near the phone. The developers could and did. They told the BBC that the process was "remarkably easy." Many services on the Internet are free, such as Google, Facebook, YouTube, Twitter, and other sites. But advertising is sold to pay for these free services. Apps that listen may be able to provide more helpful search results and ads. But you may not want your phone listening to you. Be sure to check the permissions you have given apps to access the microphone on your phone. Some apps need the microphone access to work correctly, but others do not. Never give permission to use your microphone unless the app needs access to it. Some apps need the microphone for their operations. For example, Shazam, an app that identifies songs being played, must use the phone's microphone. But other apps may not need the microphone so they should not have access to it. Turn off the microphone for any apps you do not want to have access to your microphone. You may want to turn off microphone access for all of the apps on your phone. If you find an app requiring microphone access you can always turn it back on again. To make sure apps are not listening to you, turn off microphone access on your iPhone. 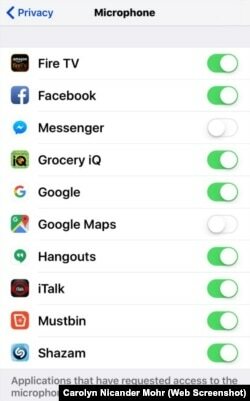 Go to Settings, then Privacy, then Microphone, to see a list of all of the apps that have asked for permission to use your microphone. Turn off permission for any apps you do not want using your phone's microphone. 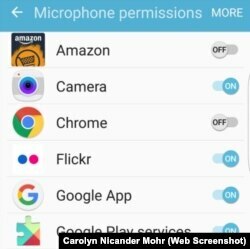 Some Android phones let you to see which apps have permission to use your microphone and turn off that permission. To turn off microphone access, go to Settings, Privacy and Emergency, App permissions, Microphone, to see a list of apps that have permission to use your microphone. You can also turn the phone's power off or leave the phone in another room to make sure you are not being listened to. Or you can try a microphone blocking app from the Google Play store. These apps have had mixed reviews. Do you wish your phone would let you know when the microphone was in use? Have you tested to see whether your phone is listening to you?